We’re living in the age of information and technology. And more and more people are turning to technology — wearable technology, in particular — to help them track every aspect of lifestyle and health. In fact, wearable technology currently sits at number three in the American College of Sports Medicine’s (ACSM) survey of the top 20 fitness trends of 2018. Food-tracking apps (like MyPlate) and medical devices (like glucose monitors) help people keep tabs on their nutrient intake, while smartwatches help them track activity, heart rate, sleep and much more. 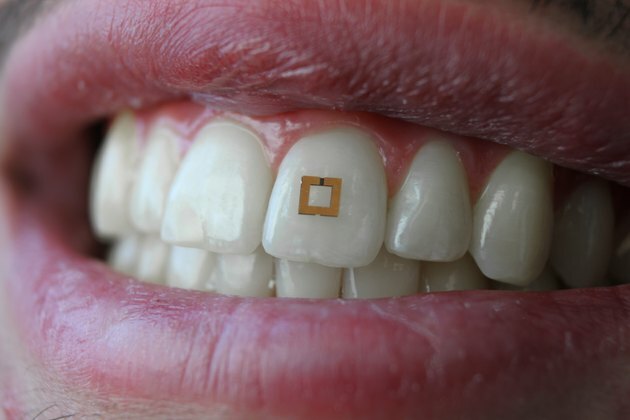 Now researchers at the Tufts University School of Engineering in Medford, Massachusetts, have taken wearable technology to the next level with the recent development of a miniaturized food-tracking sensor that can be adhered directly to the surface of a tooth. Currently, food-tracking technology is limited to self-reported consumer apps and glucose monitors. But none of these options offer an accurate, 360-degree view of the food you’re ingesting (figuratively, of course). It might seem like something out of a sci-fi movie, but the miniature Tufts sensor (its footprint is a mere two millimeters by two millimeters!) has a “bioresponsive” inner layer that absorbs nutrients from foods and liquids and, together with the outer layers, forms an antenna. By placing a small copper coil next to the sensor, the antenna then collects and transmits radiofrequency waves to a mobile device. Specific nutrients like sodium and glucose change the electrical properties of the sensor’s inner layer. In response, the inner layer absorbs and transmits a different spectrum of radio-frequency waves, which allows those nutrients to be measured. While its current iteration only detects salt, sugar and alcohol, co-creator Fiorenzo Omenetto, Ph.D., a professor in the department of biomedical engineering at Tufts, says it may be possible to modify the inner layer to target other nutrients. While the sensor isn’t available for consumer use just yet, initial research published in a 2018 issue of Advanced Materials suggests this technology is headed in the right direction. Future versions of this tooth-mounted sensor hope to offer us an easy-to-use method of gaining real-time insight into how our food intake affects our individual physiology, including mood, energy and weight. Having an accurate method of tracking fundamental nutrients is especially helpful for people with high blood pressure, diabetes, heart disease and other health issues that require close monitoring. Salt intake, for example, can be tricky to track, and if you use a food-tracking app to log your meals, you’ll never know how much fat or salt content was actually in the steak you had for lunch, as it largely depends on preparations that are out of your control. “We’re trying to remove the guesswork that exists in dietary assessment,” says paper co-author Peter Tseng, Ph.D., assistant professor of electrical engineering and computer science at the Henry Samueli School of Engineering at the University of California, Irvine. And there are positive implications for those trying to lose weight too. When working with weight-loss clients, registered dietitians currently have to rely solely on reports from the clients themselves, which are often inaccurate. Over time, these inaccuracies can have negative health implications beyond weight loss or gain, such as high blood pressure and high blood sugar, says Jonathan Valdez, RDN, owner of Genki Nutrition and media representative for the New York State Academy of Nutrition and Dietetics. This new technology is more accurate than self-reporting and less tedious than weighing every single thing that goes into your mouth, he says. In addition to providing an accurate calorie count (which is vital to weight loss), Rachele Pojednic, Ph.D., assistant professor of nutrition at Simmons College and former research fellow at the Institute of Lifestyle Medicine at Harvard Medical School, says future tooth sensors could theoretically offer insight on foods that keep you full longer, foods you tend to overeat and which nutrients you may be losing once you start cutting calories. But not all experts are convinced that this is the ultimate answer to weight loss. Samantha Heller, RDN, senior clinical nutritionist at NYU Langone Medical Center, believes this tooth sensor may be very useful for clinical issues (e.g., congestive heart failure), but not for general weight loss. And both Pojednic and Valdez agree that a food-tracking tooth sensor could potentially lead people down a slippery slope. “This fanatic tracking could lead to some disordered eating behaviors and unhealthy relationships with food,” Pojednic says. Earlier attempts at in-mouth food-tracking sensors required bulky wiring, or they simply degraded too quickly to offer accurate measurements. In response, many researchers and engineers simply create dissolvable biosensors that can last anywhere between a day and a week. But as the sensor degrades, its accuracy declines. And when tested in humans, the sensor lasted as study subjects swished various liquids in their mouths for two minutes (tap water, apple juice, mouthwash, alcohol and noodle soup). Though it’s unclear exactly how long the sensor would last in the mouth if worn beyond that time frame, researchers were able to gather consistent data from the sensors while soaking them in different liquids over the period of a week. According to Tseng, the Tufts sensor solves a fundamental issue in the field of sensing: having a safe, accurate, long-term sensor that can work remotely in a biological environment. There are still a few kinks to work out before the sensor could move beyond the lab and into the commercial realm. For one, the data that’s collected is very complex and needs analysis — a task that’s beyond the scope of the average wearer. In order to bridge that gap, the sensor would need an app-like interface to gather and display the data in a user-friendly way. In any case, this is perhaps the first sensor capable of actual food measurement, and it offers a glimpse into the future of nutrient tracking. One day we may be able to quantify how our food is affecting our overall health — in real-time.